Home / Democracy / Elections / Latest Post / Public Interest / My Idea Of A Manifesto – Any Takers? My Idea Of A Manifesto – Any Takers? Manifestos of political parties are tumbling out of their closets of late. The election season asks for such literature been thrown at the voters to shake their psyche a little before the voting day. Parties cutting across our political discourse are busy coming up with their manifestos to show how and in what way they are different from their opponents. While few of them talk sense, most of them try the divisive tactic to its flying best in fooling the populace. Few other of them are outright deplorable, like that of Congress party’s, which I thrashed in my last post. If you haven’t read it, I will urge you to read it here first. But largely, none of the manifestos talks about the problem that the nation is facing. In many ways than one, each party advocates its astounding appeasement qualities for one community or the other. None of the parties seems too interested to resurrect the rapidly failing institutions of importance and values. Be it Congress for whom the Muslims are the first and last matter of importance or the BJP for whom it is always the Hindu sentiments that plays the paramount concern, with little bit of text on proposed governance and development in between; it is all but mundane and sickening. None talks about the larger interest of the nation. So yours’ truly decides to propose his version of a manifesto, which talks more about the nation than individual or a community. A manifesto, where it does justice to the larger interest of the nation than a group. Hope there are few takers for this in India. There we go. Responsibility to community service – Every person must employ at least 30 hours of community service each year. That could simply be educating kids from the nearby slum or gong to a Gurdwara/Temple/Mosque and serve the people. Responsibility to behave – Mere Rs 20/- fine for occupying a ladies or senior citizen seat in public transport is not just enough. It needs radical change, both in terms of public behavior and the repercussions of not adhering to them. Get hold of such ill-behaved louts and fine them heavy. Ministry of Hindu Affairs: I don’t see a reason why we shouldn’t have one such ministry. A major chunk of the nation is Hindus and they have a lot of problems both economically and socio-economically as well. This needs to be addressed in the same manner the ministry of minority affairs does. Seculars might have a problem with this proposal but then, why can’t Hindus have their own ministry when the minorities can? Hindus are in distress for various reasons and it is time the government takes a note of it before it blasts at a dangerous proportion. The aspirations of Hindus are taking a beating from the Nehruvian era and it is about time the misplaced priorities are addressed. I am sure any such ministry might help reduce the flared up emotions because the inherent neglect the Hindus feel in their own land. Any such ministry should be headed by a responsible and rational individual with deep knowledge of Sanatan Dharma, there by spreading the ethos of this beautiful religion in a proposed and structured manner. Not to mention, it also should take up the interest of the entire community which is long been overlooked under the avalanche of appeasement politics. Improving Health sector: Again a mere 3% of GDP sounds peanuts against the 1.2 billion people we want to address. The health benefits should start from the earlier stage till the end. Mere carrot of health insurance is not sufficient to address the issue. Time has come for grassroot level implementation and that is possible when we prepare ourselves to spend more. Like the Polio vaccination drives, government must arrange health check-up seminars every quarter in every city/village of this country. Not only the check-ups but also the subsequent treatment, if needed must be provided without any delay. There should be a central monitoring committee (separate and independent of the health ministry) to oversee the development in providing public health care facility. Every school must have once/quarter health related symposiums to track the growth related artifacts of our kids. Again a mere mid-day-meal scheme not going to elevate the chronic mal-nutrition problem of our country. It has to be tackled by rising to the occasion than just lazing around in our chairs and furnishing absurd excuses every time. A single malnourished child is a big shame on our face and we must do something to set right such deplorable facts. Reservations for Economically backward: Time has come to fix this menace as well. Ambedkar proposed it for only 10 years but the louts in our political circle have dragged it way too long. Now the situation is such that there is almost a role reversal where we see, deserving people from upper cast are languishing in the rot in want of opportunity while people who were so called backward are enjoying the nonsense for quite too long. This quota system must be abolished and supporting the economically backward, irrespective of religion or caste must be encouraged. This again should be implemented on a strict time frame of 10 years and be abolished immediately after that. Personally I like Rahul Gandhi’s reservation in private sector idea but that should be based on economical stature, not just caste. Reform in Govt jobs: Not only police but our entire government task force needs to be reformed. I don’t mind dedicating an entire ministry to preside over this reform process over a time bound manner. There are lots of people who don’t consider themselves as public servant but the exact opposite. Most notorious of them are the mid-level patrons in our public offices. To begin with, a strict reform must start with unquestioned and uncompromised accountability. Each employee of our Govt machinery must be asked to perform certain duties with clear cut out line of his/her responsibilities and where precisely he/she stands answerable. We can’t allow these Babus to run havoc on anything and everything and yet not answerable to their misdeeds. And a review assessment of every employee after each year, like the appraisal cycle in Pvt offices must be implemented. Here the citizens must be allowed to have their say and they should be encouraged to give their feedback in a systematic manner. I even don’t mind having periodic ‘know your servants’ sessions for the citizens to go through and comment. Relieving the Tax burden: Honestly, the direct tax is no answer. It is just the old wine in a new bottle. In a way, people will still continue to pay 60% of their income in one form of the tax or the other. Instead, fines must be tripled or even quadrupled for each kind of mischief. Levee heavy tax on luxury goods, a manner it should look luxury. Impose heavy tax on Cigarettes and liquor. Transfer the tax burden of the buyer of a new home from him to the builder. Capitalists have made a lot of merrymaking over the last 60 years and it is time they pay back the nation. Introduce celebrity tax and impose heavy tax on private entertainments like post movie success party, post IPL party, different movie awards and so on. Increase tax on 5* hotel stays by some margin. If possible include substantial tax on foreign trips, other than for education, health or employment reason. In nutshell, abolish the tax system and find avenues to generate revenue by other means. Long we have tortured the 4% working middle class and they certainly deserve some relief. Policies for women: This 30% women quota is nonsense and more of depriving other deserving candidates from their legitimate share of success. Rather, empower women to come forward in life to contribute equally to the society. Vow to have at least one female earning member in each family in next 10 years. Provide education (even if required free), opportunity or anything that looks like a hindrance now. Have speedy justice for all those women who are harassed by the society. No dragging of feat in acting against thugs like the Khap Panchayat or the Mullahs who find women are objects of pleasure and reproduction. No lenience to those parents who find sending the daughters to schools as a social stigma. Will come up with my second list in few days. Till then feedback on this list is welcome. 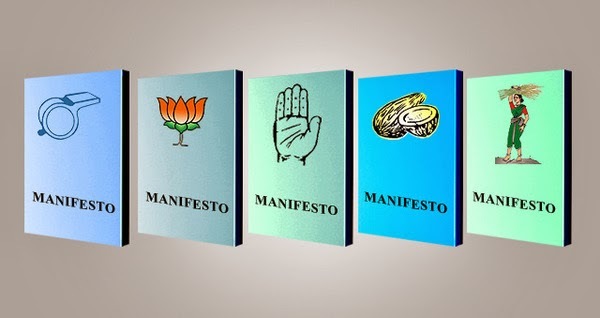 If EC could make it mandatory for the parties to show (in their manifestos) the extent to which each of the parties (who could form the government) have succeeded in fulfilling the promises that they have made in their manifesto before the last elections, it would be helpful to the voter to decide whether or not he / she could vote for them again. One huge injustice that our nation faces now is blatant misuse of human resource by capitalists. Employee has to sacrifice his/her entire life for peanuts. People are molded to believe that work is first but in the process they are not able to give time to themselves and their family. So much distress workforce has to suffer due to lack of time, cannot look after ailing family member, cannot satisfy needs of children, unable to get health checkups for themselves all for lack of time just to name a few. Our capitalists proudly proclaim outside India that Indian workforce is dedicated in their job but I find this very arrogant. These capitalists have almost converted workforce into slaves. Would have appreciated had the workforce paid properly but instead their pay is not much either. Most people work inhumanly not willingly but due to families economic needs which gets exploited. And to make the matter worse, the person who is least paid has the longest work hours. Labour laws are not adhered because which employee will talk against employer? This needs to be addressed genuinely. Now different casteism exists. We have political class, business class, service class, most children of these classes follow their family profession. There is no equivalent to brahmin varna now as knowledge is standardized as per western system and it is decided upon & taught by people in service class. With these new classes, the exploitation continues inter-class. Of course the most exploited is the economically backward of the three. With modernisation there are different classes formed such as, urban-rural, agriculturist-non-agriculturist to name a few. There is constant struggle amongst these classes but irony is that the society still talks & condemns old caste structure (varna system) of India but totally ignores the current class struggles and accepts it almost as inevitable. I am not against any class, they are unavoidable as long as civilised societies exists, that's why varna system was formed in first place but unfortunately, people in power exploited it for their benefit. Now we have a chance to change, a class in position should not be able to redistribute wealth in favor of few. No I cannot support AAP or communist but people in position has to be more responsible and should be kind to people who are less fortunate. Agree with your points. I don't pay much attention to the manifestos myself. Congress one was a copy-paste of 2009 as expected, and I don't think the BJP one will be much better. As Modi is busy campaigning I doubt he will have much input so it will probably be written by the old guard. On the other hand, I don't know if you watched Modi's interview with ETV, but he specifically says his main priorities are improving health and cleanliness, ending reservations, empowering women and reforming the bureaucratic processes. So I think he hit most of your points. Can e-Governance help eliminate corruption ? manage to get away ? Already , every Agency compiles huge dossiers on "
/ scattered profiles of " Suspects "
- and do it within 6 months of assuming power "
Petition not required, all heads of state automatically get Visas. Now why Modi would want to visit the US for the next 10 years is the question.